Megastar of stage, screen, and television, Geneva Jordan now has a command performance in Minnesota, where she agrees to look after her thirteen-year-old nephew, a boy with Down’s syndrome, while his parents take a long-overdue vacation. Though Geneva and her sister, Ann, are as different as night and day (“I being night, of course, dark and dramatic”), Geneva remembers she had a family before she had a star on her door. But so accustomed is she to playing the lead, finding herself a supporting actress in someone else’s life is strange and unexplored territory. Then the discovery of an old scrapbook that she and her sister created long ago starts her thinking of things beyond fame. 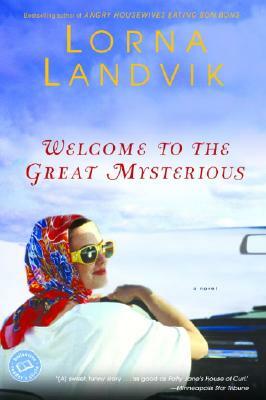 For The Great Mysterious is a collection of thoughts and feelings dedicated to answering life’s big questions—far outside the spotlight’s glow. . . .
Lorna Landvik is the author of the bestselling novels Patty Jane's House of Curl, Your Oasis on Flame Lake, and The Tall Pine Polka. She is also an actor, playwright, and proud hockey mom.